Where can I get data supporting this? Data from Hyman’s paper would be great! EDIT: more precisely, I'm looking for a complete, trial-by-trial dataset; not just averages. 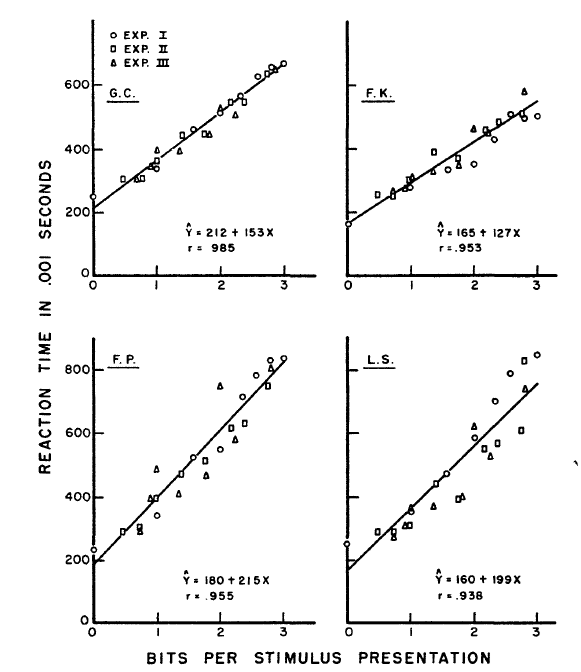 In Hyman (1953) the following data is shown (Fig.1). The bits of information were the number of choices in an AFC task, where 1 to 8 alternatives corresponded to 0, 1, 1.58, 2.00, 2.32, 2.58, 2.81, and 3 bits of information (the 2log of the N alternatives). Not the answer you're looking for? Browse other questions tagged data psychophysics or ask your own question.